You Won't Find Any Higher Quality Bits Than These! 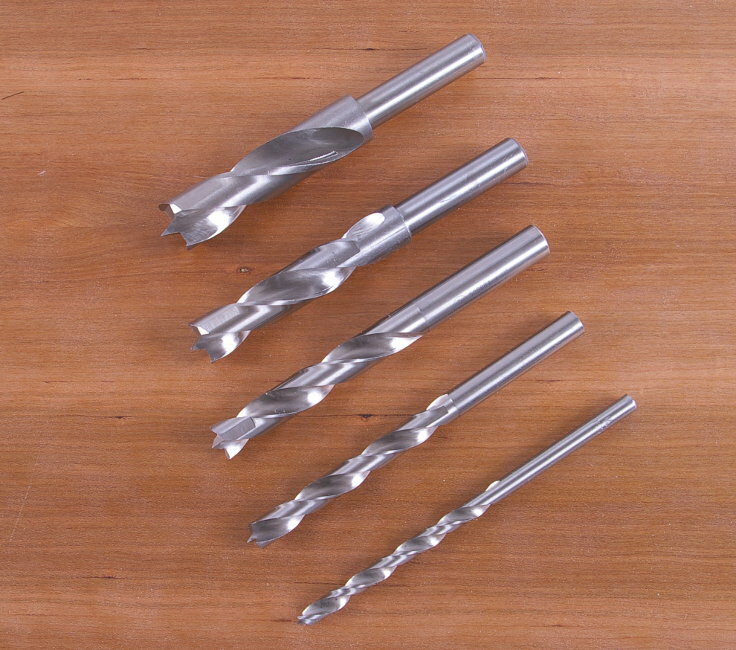 Brad-Point Bits are your best choice for most woodworking applications: Boring holes for dowels or round tenons; Pilot holes for screws or bolts; Counterbores. Whenever you need a clean hole, you need a brad point drill bit. These bits are manufactured to our exacting specifications from high quality carbon alloy steel to take and hold a keen cutting edge. 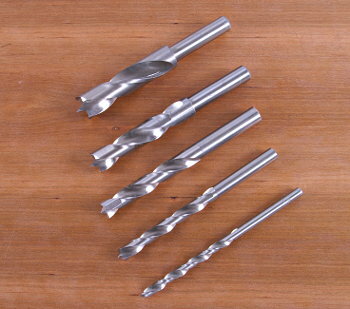 If you're struggling to bore clean, attractive holes in wood with ordinary twist-style or spade bits, you're making a mistake. 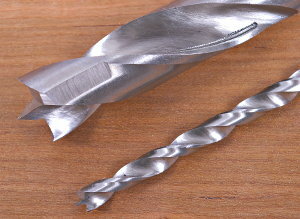 For general purpose wood drilling, nothing beats brad-point bits. The larger the hole or the harder the material, the lower the speed. Drilling too fast will burn the stock and ruin your bit. Feed the bit into the hole slowly and evenly with light, steady pressure... and retract it frequently to clear the chips. Use the Shopsmith Speed Reducer when using Forstner Bits or large diameter multi-spurs or other bits over 1-1/2-inch... especially in hard woods. A super-sharp point at the tip locates the hole with unwavering precision, then “bites-in” to hold the bit on center as it advances. The two side spurs slice cleanly through the wood fibers, making a perfectly round, splinter-free entry and exit, while the deep chip channels eject the chips quickly. Shopsmith Brad Points are available individually or in convenient sets, as described below. All bits above 1/2-inch have 1/2-inch shanks. Pro Package - includes 1/4", 3/8", 1/2", 5/8" and 3/4" bits. Pro Enhancer Package - includes 3/16", 5/16", 7/16", 7/8" and 1" bits. Pro Ultra Package - includes everything in the Pro Package & Pro Enhancer Package.